Review originally posted on November 6, 2009. What ever happened to all those old toys and doodads you had when you were a kid? Doesn’t it feel like they have just simply vanished off of the face of the Earth? That is the premise behind the latest anime movie from Production I.G., Oblivion Island: Haruka and the Magic Mirror. As a child, Haruka heard an old Japanese fable of how all the items that have gone unnoticed and forgotten by people eventually get picked up and taken away by nature’s most sneaky creatures, foxes. Now your typical rebellious teenager, Haruka wonders what ever happened to a mirror given to her by her late mother. She happens upon a Shinto shrine and makes an offering to the gods to return the mirror to her. 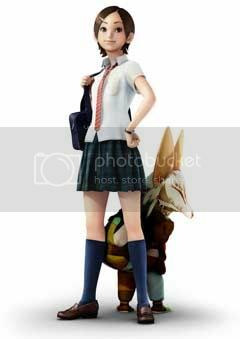 There she encounters a tiny fox-looking creature named Teo carrying an abandoned toy plane. While following him, she is suddenly swept away to Oblivion Island, a secret world inhabited by Teo’s people and built entirely out of the objects that humans have long forgotten about. So now she teams up with Teo to explore the island and find her long lost mirror. The movie is making its official debut this weekend at the New York International Children’s Film Festival, but Fuji Television was generous enough to invite me to an exclusive screening of the film last October. What I saw was an absolutely delightful children’s film filled with more imagination, heart, and wonderment than the last two Miyazaki films combined. Oblivion Island is the first full length film from Production I.G. done completely in 3D computer generated animation. The film’s animation director, Naoyoshi Shiotani, was on hand at the private screening last fall to offer his take on the making of the studio’s landmark title. While almost every animated film in America is done in 3DCG these days, we very rarely see it done in Japanese anime. However, the difference between Hollywood and Japanese cinema is still evident in this particular medium. The character designs have that unique “anime” style to them, and the look and feel of the animation resembles more like a video game cut scene than a Pixar or Dreamworks film. This is a little difficult to get used to as a viewer. Human characters like Haruka and her parents give off the look of plastic, lifeless dolls, and their body movements are stiff and unnatural. But the awkwardness of the CG animation completely fades away the moment that Haruka and Teo go to Oblivion Island. 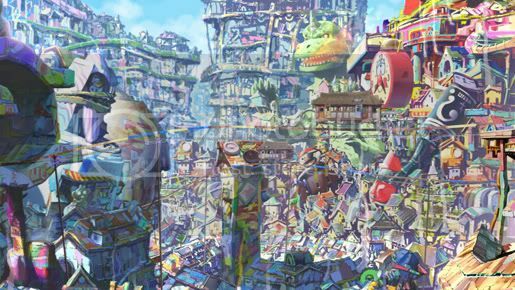 The fictional world is so beautifully rendered with vivid bright colors, and incredible detail has been paid to the buildings comprised completely of old signs and cardboard boxes. But even more impressive than the visuals is the emotional story of how teenage Haruka reconnects with her own childhood by wondering around the island. 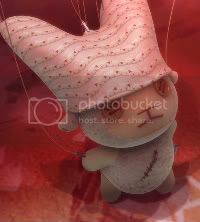 The turning point comes when she stumbles upon Cotton, her adorable long-forgotten stuffed animal. And we do. Cotton’s reunion with Haruka brings about the same kind of emotional identification and response we had to the “When She Loved Me” flashback montage in Toy Story 2. But unlike Toy Story, Haruka and her cherished doll are able to speak to each other in this magical island, thereby putting into words the type of love that is otherwise implied between a child and their toys. When I gave Miyazaki’s Ponyo a negative review last summer, the biggest reaction I heard back from the community was, “well, that’s because it’s made for kids, so of course you wouldn’t like it.” But being a children’s film doesn’t mean it has to be a bad film. With its childish blend of fantasy and Japanese traditions, Oblivion Island has shown me just what Miyazaki has been missing since Spirited Away. This movie is too good to be kept hidden in Japan forever, so I am thrilled to see the NYIFCC selecting it as part of their program this year. Oblivion Island is the best anime film I’ve seen in a long time, and I hope more American fans have the chance to see this heartwarming and delightful 3D story too. This entry was posted on Thursday, February 25th, 2010 at 1:06 pm by Scott	. « The Daily Almanac: It is Time of Closing a Library.